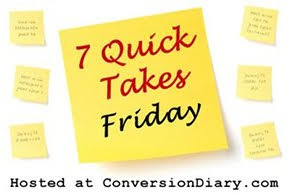 Taking the lead from Jen at ConversionDiary.com, I'm going to try a "7 Quick Takes Friday." Sort of a week in review of, hopefully, salient and relevant reflections. A "look back" so to speak of the week that has passed. 1. Of course, Haiti is the big marker for this week. 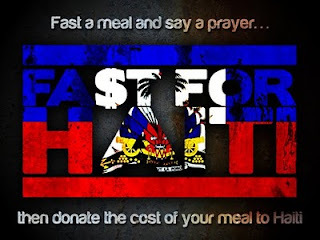 Catholic Relief Services is involved with a project called "Fast for Haiti" What if thousands of people decided to fast from one or two or three meals and donate the money they saved to Haitian relief? 2. The whole concept of sacrifice and fasting has been on my mind a lot this week. Especially since I just watched the film, "The 13th Day" about the apparitions at Fatima. The primary exhortation in those appearances was prayer and sacrifice. I really need to work on the sacrifice part. Come to think of it, I need to work on the prayer part, too. 3. Back to sacrifice. ..I listened to a beautiful talk by Imaculee Ilibagiza of Rwanda. In the apparitions in Rwanda, the Blessed Mother did not ask the people to fast. Why? Because they barely had enough food to survive on in the first place. Even with those dire circumstances, she still asked them for other sacrifices or mortifications. Wow! I think giving up cookies is a mortification. Lots of work needed here. 4. Made final arrangements for hotel accommodations for the March for Life. Looking forward to it. Perhaps a mortification will be involved. (freezing cold weather?, or perhaps, keeping my mouth shut while driving). 5. Still working on putting all of the Christmas decorations away. It's like saying good bye to old friends. OK, I know, a little weird. But the nativity scene is still out and I feel a certain peace every time I walk by. Thanks to Dad, I now have an ox to complete my manger. 6. Shopping today with a really good friend. Lots of laughs, lots of reflection on our blessings, and lost of thanksgiving to God for all of the goodness he showers us with. 7. And, finally, it's back to Haiti, Haiti, Haiti..... God help those poor people. And may the souls of the faithful departed, through the mercy of God, rest in peace. Eternal rest grant unto them, O Lord.